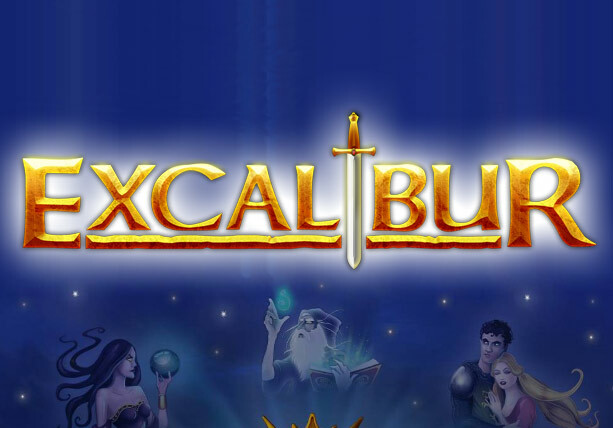 Join King Arthur and his merry men to uncover the mystical sword, Excalibur in this 5 reel medieval online slots casino game. Duel with magicians and warlocks and stake your claim at returning the sword and winning some huge cash prizes, Visit Easyslots.com! To see more NetEnt games click here. 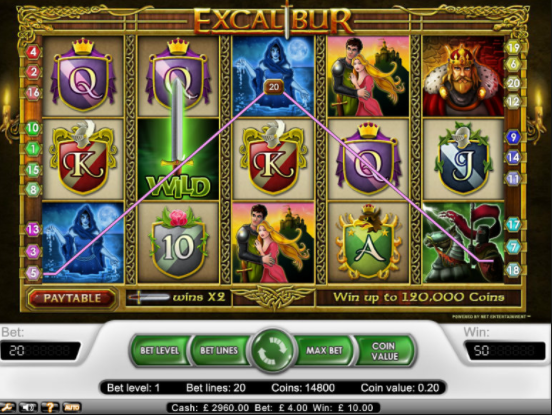 Excalibur is a 5 reel, 3 row, 20 payline online video slot game. For 2017, this game meets the standard requirements to become an iconic and established household name. As you may have already guessed Excalibur adopts a certain medieval slash legend theme. If you’re interested in stories of King Arthur, swords stuck in stones, knights in shining armour, and damsels in distress, then this is certainly the game for you. The Game feature two WILD icons that both behold the image of Excalibur, the legendary sword of King Arthur. Discover these WILD icons on any of the gameboard’s reels and you will be granted with double your initial stake. It’s all about those winning combinations. The Golden Wild will only appear on the middle reel and when landed upon will see your initial stake quadruple to 4x its starting amount. For more information, visit the site today! The Scatter symbol of the game is represented by the Golden Chalice and landing upon 2 or more of these babies. Three or more of these scatter symbols will grant you a huge amount of free spins with 10, 20, and 30 spins rewarded respectively for 3, 4, and 5 Scatters landed. Excalibur is now five years old, and following its release in 2012 is starting to show its age. Despite this it does stand up to be counted, and proves that NetEnt’s games are certainly built on quality, innovation and fresh technology. We also often run various slots bonuses UK with this game. There’s not a lot more to say about Excalibur other than that it’s a simply wonderful game. Despite being nearly 5 years old the colouring, technology and gameboard is still fresh. We could do with maybe an added side games to take it right up to date but nevertheless the simplicity is key with this slot game. In addition, you can’t go wrong with the theme. This 5 reel is warm and splendid and a slot game about Knights and King Arthur will always have a certain cadence surrounding it. Don’t hesitate to play this game today and become a night of the realm with King Arthur’s men. This game is a 10/10 instillation from NetEnt and will certainly put you on the right path to free spins and cash prize glory. Another popular online slots game, visit the site now!